Spring is always an exciting season and the perfect time to revive your wardrobe. Although it can be a tricky season for fashion lovers because the weather warms up and you might not be sure exactly how to wear an outfit, you can find a lot on inspiration if you visit a fashion tips site. Keep in mind that in the fashion world there’s an overlap between summer and spring clothing. These hot spring fashion trends can also be worn in warmer weather. Bold, uncomplicated stripes sliced horizontally or vertically make incredible spring fashion outfits. Whether you choose all-American denim, nautically inspired or lined dresses, you will look chic and classy. Moreover, they can be worn them for many season and even years to come. However, horizontal stripes can make you look wide, so choose vertical lines if you are not very tall. 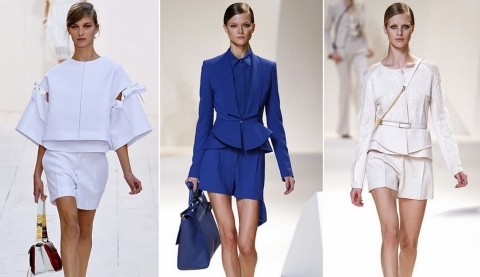 According to more than one fashion tips site, short suits are the hottest spring fashion trend for those hard working ladies who also want to look astonishing. This popular look on the New York runways is the ideal blend of femininity and masculinity. Shorts suits are versatile, bold, office-appropriate and a must have in the spring. Statement glasses are the perfect accessory to add to an outfit, whether it’s business or casual. These glasses hit the runway in many sizes and shapes, suitable for any face. The fabulous spring fashion shades are a no-effort way to turn up the volume of your wardrobe. There is no need for high heels and makeup when you have a pair of statement glasses. Moreover, you can get inspired by Japanese fashion street and make your sunglasses the centerpiece of your outfits, or create your outfits starting with the sunglasses. Japanese fashion street also likes to make use of as many elements as possible; while this is not a characteristic of Western fashion, there are several combinations you can try, such as mixing different patterns and colors. The Bermuda shorts are present on the New York spring fashion scene so make sure you invest in a pair of ultra-versatile, slouchy shorts. Besides being flattering and fam-friendly, Bermuda shorts can be worn with blazers, heels, t-shirts, flats, shirts , tank tops and even dresses. What’s not to love? Low, pointy 90s heels are back in style this year and have been modernized with cylindrical heels and dainty ankle straps. Of course, four-inch pumps remain the stars of the night, although these heels are an excellent daytime option. Wear them with Bermuda shorts or boyfriend jeans to spice things up. Sporty dresses with shoulder-showcasing bodices and flirty A-line are perfect for this season. You can easily wear them with high-heels sandals or flats and even sneakers. Add a letterman jacket or a collegiate cardigan for those cool spring nights.